I bought this for my daughter and she loved it! It’s not a really thick rug but it has a textured nap to it that gives it a little bit of depth and definition. The back has like a latex or rubbery surface which helps it to not skid. She really loved the tile designs and colors in it. 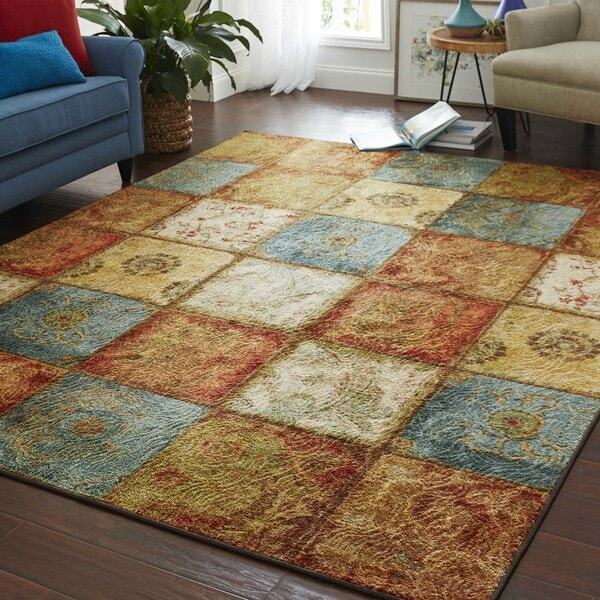 Lend a touch of trendy appeal to your home with this elegant Bienville rug from Copper Grove. The rug is machine-woven from nylon, and features a soft touch, a stain-resistant design, and contains latex for added durability. The rustic colors of the distressed paisley and floral print pattern complete the traditional style of this rectangular rug. Option: multi - 1'8" x 2'10" | multi - 2' x 8' | multi - 2'6" x 3'10"
I was seeking a runner for my kitchen, which we just refurbished with several European colors. We wanted something that could be washed up readily but looked more "luxurious" than a cotton rug. We've had this down for a week now and it lays flat just fine. I love the non-slip backing, so no need for a separate rug pad. The rug does not have a high pile, and is just right for a high-traffic area. I'm waiting on the delivery of the smaller accent rug in this same pattern, but in the meantime, I'm ordering another runner to put away for sometime down the road when this one may wear out -- for the price and use, the quality is just fine! Wish they had one in this pattern big enough for the dining room. Ordered this 8x10 rug on a Saturday and received it on the following Tuesday! Absolutely love the colors and style. Very true to the photo. Looks great with my furniture. Fairly thick pile. I think it will be easy to keep clean. Have already recommended you guys to friends and family. Love Overstock! love this rug! I ordered it because I thought the colors would work well in our family room and it is perfect! there is a subtle pattern in each square that I did not notice in the picture but it is still a great rug! it lays flat and does not slide around. I ordered this rug to go under the dining room table. If you want a plush, thick, high pile rug, this is NOT for you. But it is a perfect under the table rug. Very pretty, more vibrant than in the photo. Very Tuscan in it's colors (think Panera restaurant). The chairs slide easily on it and it's a snap to vacuum with the same attachment with which I vac the hard wood floors around it. And, it was delivered in 3 days. That was the best surprise of all. If I was into matchy matchy, I would probably buy the runner as well. This rug is a stunner! I bought it simply to go in a 'naked' wood-floored dining room as a runner. The colors are MUCH more vibrant than pictured,, Indeed, the various squares in the pattern of the rug are made up of combinations of browns, beiges, rusts and a blue that borders on turquoise. Not one square on the pattern is to be overlooked. A couple of overlooked qualities may be the 10' length, which goes across most of the length of many rooms. Another nice feature is the latex backing which makes the rug almost non-skid. And yet another nice feature is a thicker pile than most of those available in many department stores. I would happily buy this product again. Option: multi - 2'6" x 3'10"
This is a good weight rug. However, the colors are much brighter & lighter than in the picture on the site. The blues are a light aqua, and the golds are closer to a yellow, the reds more orange. The rug is of a good weight with a non-skid backing. Option: multi - 2' x 8' | multi - 2'6" x 3'10"
I bought 2 of these rugs and the matching door mat. I love the slip proof rubber backing that these already have. The colors are vivid without being overpowering. I also bought another area rug and they go so well together they look like they belong to the same family. I really like this rug. I was looking for a non-slip rug for my laundry room to brighten it up and provide protection for the wood floor. I was really happy to find a rug that has an interesting transitional design with the non-slip backing. It's similar to a rug that you'd expect purchase at Target for around the same price. I liked the rug so much that I just ordered a second one for under my kitchen bar stools. Someone else mentioned the crooked edges -- I didn't experience that. There is a binding around the edge of the rug which in my mind is fine for the price point. The rug lays straight and the workmanship is absolutely fine for a $40 rug. I would recommend this if you're looking for a rug for high traffic areas that is non-slip and easy care. vibrant colors, well made. I use it in my entryway; it adds an inviting colorful touch. It looks like a very busy, bold rug. In reality the colors are muted just enough and is perfect with my country decor. Due to all the different colors in this rug you can have any colored accent, such as pillows or pictures, in your room and it will all coordinate. LOVE IT! These are comfortable to walk on and lay nicely on the floor without curling. I was very happy to get a good deal on this rug. The colors are awesome - just like the pictures show. I actually bought two of them for a combination living/dining room area. They shipped really fast too. Colors and designs are great. I wish it had been thicker so the corners wouldn't turn upward. The rug is exactly as pictured, and the colors are nice. I have this on a kitchen ceramic tile floor, and it is completely slip-resistant. It is quite thick and soft, and it feels great to stand on in front of the sink. The best thing about this rug is the no skid backing already on it. I've had mine for four years now and it's great! Update 2019: STILL using these rugs, they are indestructible! They haven't unravelled or split or torn at all and I've washed and dried and vacuumed them for years now! This looked much better in pictures. It is flat and already starting to ball up. In one week. Returning it. Very disappointing. This area rug is perfect for our home, in fact we have 3! It pulls all the colors together and makes our family room, living room and dining room all cohesive. Can't beat the price and the quality. The square pattern was chosen to blend with other geometric patterns in my home. The colors are exactly as shown on the website, and goes beautifully with drapes and cabinets in the surrounding area! It looks really nice in my room, color combination is ideal, it matches with everything. Shipping was super fast and price very nice also. "what is the exact size of the 5x 8 rug? thank you!" The size is a 5’ x 8’, it may be few inches shy but not much. "Is there rust and olive colors in this rug"
The color is listed as multi, but some squares do have a hint of rust and olive color. The pile height is 13/32 inches. I would say 1/2 inch. It isn't flat. I have one at my french doors and it rubs the top of it when I open the door but it doesn't move the rug. I think it is just right. I love this rug.I have two of them. Are there any shades of green in this area rug? I love the colors in this rug but, in need of some green too. I am looking at what looks like green but it could be tan too. You can never tell online. "What size of rug is this? I want 6x9." "Is the blue color a teal shade?" There are shades of a light blue and medium teal. "Is this rug fire rated?" This rug features a latex backing.